Remember when Obamacare was to create 400k jobs immediately? Before the President signed his health care bill into law, Democrats claimed the proposal would create jobs. Then-House Speaker Nancy Pelosi infamously declared: “So this bill is not only about the health security of America, it’s about jobs. In its life it will create four million jobs – 400,000 jobs almost immediately. In this latest report, CBO confirmed that Obamacare’s flawed policy disincentives are expected to drive 2.5 million people out of the workforce by 2024. That is nearly triple the impact CBO had estimated in 2010. Democrats’ health care law forces Americans to make a perverse choice between whether they want to work more, earn higher wages, but potentially lose generous government subsidies; or work less, earn lower salaries, and retain government benefits. by Sam Adams MMIV: Last week the nonpartisan Congressional Budget Office released its 2014 Budget and Economic Outlook. From Obamacare to the unrestrained national debt, this report serves as a warning of the damage the President’s policies are doing to our country. 1 percent: The amount CBO predicts the health care law will reduce aggregate labor compensation – hitting lower wage workers hardest. 1.5 million: The number of people, of the roughly five million whose health insurance plans have been cancelled in the individual and small group markets, who are expected to renew their non-Obamacare compliant policies in 2014. 7 million: The number of people who will lose their employer-sponsored health insurance by 2024. 13 million: The number of people who will be locked into a broken and failing Medicaid program by 2024. 31 million: The number of people who will remain uninsured in 2024. CBO projects Obamacare will not reduce the number of uninsured below 30 million people over the next decade. $52 billion: The total amount, over 10 years, that Obamacare taxes the uninsured, through the individual mandate tax. $151 billion: The total, over 10 years, that Obamacare taxes employers that do not offer health insurance to their workers, through the employer mandate tax. CBO projects that deficits will decrease in 2014 (to $514 billion) and 2015 (to $478 billion) – still larger deficits than any previous Administration – before increasing every year after 2015. The report estimates that deficits in 2022, 2023, and 2024 will all be greater than $1 trillion. In comparison, last year’s estimate did not expect any deficits over $1 trillion. By the end of his second term, President Obama will have seen the national debt increase by about $8.5 trillion. It will be nearly $27.2 trillion by 2024. Publicly held debt as a percentage of GDP at its lowest point over the next 10 years – 72.3 percent in 2017 – is still higher than any other year since 1950. Mandatory spending is at the heart of our overspending crisis, and Democrats don’t want to face facts. Over the next 10 years, total mandatory spending increases by 77 percent over 10 years versus the 2014 estimated level -- including a 78 percent increase in Social Security outlays; an 80 percent increase in Medicare; and a 93 percent increase in Medicaid. The biggest increase in spending is net interest – the cost of servicing our debt. CBO assumes that the interest rate on treasuries will rise eventually to near the historical average. Interest spending is estimated to go up by 278 percent over the next decade -- from $233 billion in 2014 to $880 billion in 2024. By 2021, interest costs will exceed the entire national defense budget. CBO also revised its estimates for GDP growth over the next few years. It now expects GDP to grow by barely three percent this year – down slightly from what it expected in its 2013 report. Growth drops off more significantly in the next three years, never reaching 3.5 percent. These revised estimates are far more pessimistic than CBO’s expectations just a year ago. The President and Washington Democrats should be doing everything possible to spur job creation. Instead they stubbornly continue to implement a health care law that threatens the economy, increases costs, and limits job growth. Sam Adams MMIV is the pen name for un-named beltway sources. While receiving information from many sources, this Sam's words sometimes need to be credited. Thanks to all the Adams patriots who speak up for America. Tags: Sam Adams MMIV, CBO, Scorecard, Obamacare, economy, healthcare, lost jobs, To share or post to your site, click on "Post Link". Please mention / link to the ARRA News Service. and "Like" Facebook Page - Thanks! by Nathan Mehrens: President Obama’s decision to bypass Congress and raise the minimum wage from $7.25 to $10.10 for federal contract workers is a very big deal — and not just because it will force U.S. taxpayers to shell out more money on the same inefficiently delivered, often-unnecessary government services. First, his power grab signals a remarkable new brazenness in his already contentious dealings with the legislative branch. Not only that, it marks a sudden and stunning reversal of his previous position on this issue. The President is doubling down on his far left economic agenda — shaking down American taxpayers in a shameless sop to organized labor (the prime beneficiary of his decision). Why kowtow to the unions now? Easy: The ongoing Obamacare debacle has exposed a serious, potentially debilitating political rift between the administration and union leaders — who continue to voice their “bitter disappointment” with the implementation of the new law. Using our money, he is now effectively trying to buy Big Labor back into the fold: Knowing full well the coffers of dozens of vulnerable Democrats depend on it. Looking at the raw numbers, the order doesn’t seem to pack much of a punch. At most, it would impact roughly 200,000 contract workers (out of an estimated workforce ranging from 2-3 million employees). Even this small slice of the pie could be overstated, though, as it represents an upper-end estimate of federal contract workers making less than $12 per hour. To the extent there are federal contract workers making $7.25 an hour, they will receive the equivalent of a 7.8 percent annual raise dating back to 2009 – the last time the minimum wage was increased. Have your income levels gone up by 39 percent over the last five years? Not according to data from the U.S. Bureau of Labor Statistics (BLS). Of course the real impact isn’t going to be felt by the impoverished minimum wage worker (again, to the extent such an employee exists within the sprawling federal system). Instead it will be felt up the income ladder — as labor unions peg their base-line wages to the minimum wage on either a percentage or premium basis. And higher wages for union workers means they will pay more in dues — which means a bigger campaign account for Big Labor. This decision clearly isn’t about those making minimum wage, it is about higher-wage union workers getting a bump because the entire scale must be adjusted upward. And most of all, it is about the financial boon this upward adjustment creates for their dues-collecting bosses. Who gets hurt by Obama’s move? In addition to the taxpayer, smaller contractors who bid on government work will find themselves in a far less competitive position under the new wage levels. Ultimately, that means smaller profits and fewer jobs for them — not to mention a shrinking pool of bidders for government contracts (which will drive costs even higher). There’s simply no scenario in which this plays out to anyone’s benefit: Except union workers and their Big Labor bosses. Oh, and the President’s Congressional allies. True limited government supporters oppose a minimum wage on principle. Wages should be paid based on what the free market will bear — and any attempt by government to manipulate that process will only create havoc on the economy. Congress can stop this, and more importantly, they can block the broader minimum wage hike the President seeks for the private sector economy. Nathan Mehrens is president of Americans for Limited Government and his article was shared on ALG's NetRightDaily. 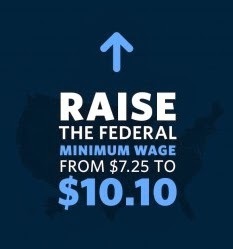 Tags: President Obama, Minimum wage, executive order, unions, Nathan Mehrens, Americans for Limited Government To share or post to your site, click on "Post Link". Please mention / link to the ARRA News Service. and "Like" Facebook Page - Thanks! 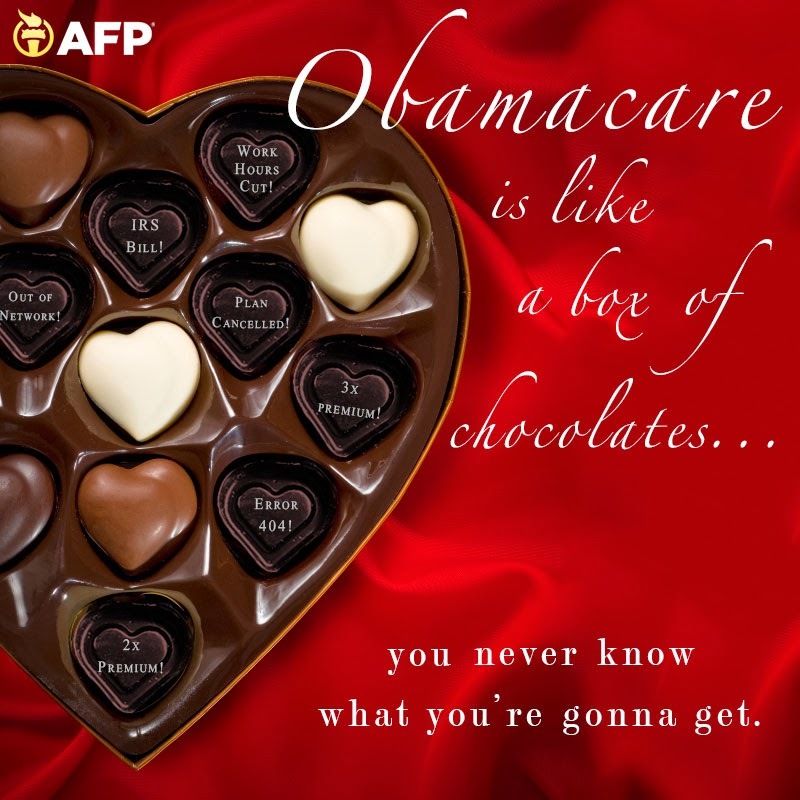 Americans for Prosperity: Happy Valentine's Day! Tags: Americans for Prosperity, Obamacare, box of chocpolates, Valentines Day To share or post to your site, click on "Post Link". Please mention / link to the ARRA News Service. and "Like" Facebook Page - Thanks! by Amy Payne, Heritage Foundation: President Obama—the imperial President, the “I’ve got a pen and I’ve got a phone” President who can’t wait to show us his “year of action”—once vowed to do exactly the opposite.The biggest problems that we’re facing right now have to do with George Bush trying to bring more and more power into the executive branch and not go through Congress at all. And that’s what I intend to reverse when I’m President of the United States of America.That was candidate Obama back in 2008. This comment somehow slipped under the radar for the past few years and resurfaced this week. Tags: employer mandate, executive power, Heritage Foundation, national labor relations board, NLRB, nuclear waste, President Obama, recess appointments, Subsidies, Video, waivers, welfare reform, yucca mountain To share or post to your site, click on "Post Link". Please mention / link to the ARRA News Service. and "Like" Facebook Page - Thanks! Yesterday, The Hill “Senate Democrats facing tough elections this year want the Internal Revenue Service to play a more aggressive role in regulating outside groups expected to spend millions of dollars on their races. In the wake of the IRS targeting scandal, the Democrats are publicly prodding the agency instead of lobbying them directly. They are also careful to say the IRS should treat conservative and liberal groups equally, but they’re concerned about an impending tidal wave of attack ads funded by GOP-allied organizations. ‘If they’re claiming the tax relief, the tax benefit to be a nonprofit for social relief or social justice, then that’s what they should be doing,’ said Sen. Mark Begich (D), who faces a competitive race in Alaska. ‘If it’s to give them cover so they can do political activity, that’s abusing the tax code. And either side.’ Asked if the IRS should play a more active role policing political advocacy by groups that claim to be focused on social welfare, Sen. Jeanne Shaheen (D-N.H.) responded, ‘Absolutely.’ . . . She called the glut of political spending by self-described social welfare groups that qualify under section 501(c)(4) of the tax code ‘outrageous.’ . . . Sen. Mark Pryor (Ark. ), the most vulnerable Democratic incumbent, said the IRS has jurisdiction over 501(c)(4) groups, as well as charities, which fall under section 501(c)(3) of the tax code and sometimes engage in quasi-political activity. ‘That whole 501(c)(3), 501(c)(4) [issue], those are IRS numbers. It is inherently an internal revenue matter,’ he said. ‘There are two things you don’t want in political money, in the fundraising world and expenditure world. You don’t want secret money, and you don’t want unlimited money, and that’s what we have now.’ . . . So are Senate Democrats trying to publicly pressure the IRS to silence groups that disagree with them to help themselves in an election year? This action by the IRS is so harmful to free speech, though, that both conservative and liberal groups are joining together to oppose this rule. Tags: Seante Democrats, pressure IRS, regulate free speech To share or post to your site, click on "Post Link". Please mention / link to the ARRA News Service. and "Like" Facebook Page - Thanks! It's a match that's meant to be. 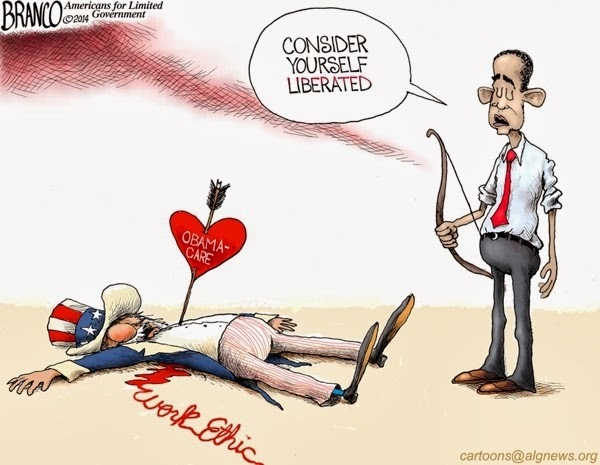 This Valentine's Day President Obama is on a mission - to identify those Senate Democrats who align just right with his liberal agenda. Senate Democrats may appear a bit shy at first, touting their "independence" from President Obama and Harry Reid. But it turns out that according to our friends at ElectionHarmony.com - they and President Obama are a near perfect match! Rather than reviewing every candidate, let's review the one with the lowest match-up at 90% with President Obama's agenda. Wow, all the rest have a 96% or higher, so by looking at Pryor, we can measure at least the progressive / liberal base line is for all of the others support is for the Obama agenda. However, we can quickly note that Colorado's Sen. Mark Udall is a spiting image of Barack Obama's liberal agenda. Interestingly, Sen. Mark Pryor's case holds the baseline with a 90% match to Obama and he represents Arkansas voters who rejected President Obama in two presidential elections by over 62%. Six years ago the Arkansans believed that Sen Mark Pryor was going to remain a strong blue dog conservative which has proven to be wrong. Four years ago they corrected the situation with regard to the other democrat U.S. Senator and booted Blanche Lincoln out of office so severely, she abandoned Arkansas for Virginia. Supporting policies that drive up the cost of energy? Higher taxes on workers and middle-class families? More reckless government spending & higher debt? Jeopardizing Arkansans' current health care plans and doctors? Time for Arkansans to Retire Pryor. 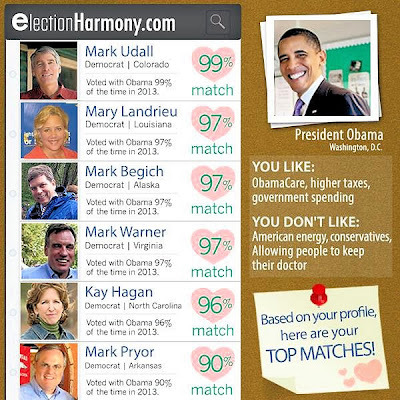 Sen. Mark Pryor's 90% match with Obama only leaves room for a 10% match with the people of Arkansans who deserve better. Tags: Election harmony, President Obama, match, Mark Udall, Mary Landrieu, Mark Begich, Mark Warner, Kay Hagin, Mark Pryor, Arkansas, liberal, progressive, agenda To share or post to your site, click on "Post Link". Please mention / link to the ARRA News Service. and "Like" Facebook Page - Thanks! El Presidente Going Bananas - I Can do What I Want! 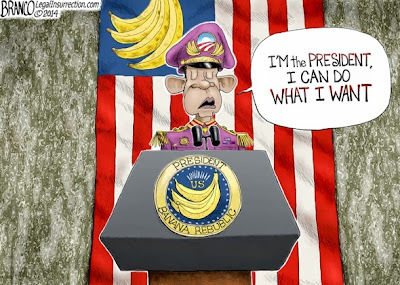 Tags: President Obama, pen, phone, do what I want, Banana Republic, editorial cartoon, AF Branco To share or post to your site, click on "Post Link". Please mention / link to the ARRA News Service. and "Like" Facebook Page - Thanks! Alan Caruba, Contributing Author: A great marriage is a marvelous and mysterious thing. My parents celebrated 64 years of marriage together until my Father passed away. Even into his 90s, he could not leave the dinner table without pausing to give her a kiss. They enjoyed each other’s company and gave each other the space to pursue their interests. Valentine’s Day arrives preceded by two weeks of commercials in which men are reminded to purchase flowers, chocolates, pajamas, or teddy bears for the women they love. In my parent’s era—they were born in 1901 and 1903—and in the era in which I spent my childhood and became a young man, the 1940s and 1950s, courtship was expected to result in marriage. Getting divorced or having a child out of wedlock was a disgrace. Compare that to the present era. My Father, a Certified Public Accountant, was the breadwinner, but my Mother also contributed because, for three decades she taught gourmet cooking in adult schools where we lived. She was an expert on wine and wrote two cookbooks, gaining awards from France and elsewhere. I grew up in a town that was the quintessential suburb filled with tree-lined streets and broad lawns. The men went off to work. The women tended to the children and the home. If we do not strengthen the traditional family, our society, our values, and our nation will be in deep trouble, if it isn’t already. A nation in which abortion was legalized in 1973 has witnessed the destruction of the lives of 55,772,000 unborn children and counting. “Monogamous families,” writes Tucker, “create socially conscious human beings ready to live in peaceful societies.” There are a billion Muslims in the world and Islam permits polygamous marriage. The nations where it is the dominant religion have a long history of warfare with each other and with nations in which monogamy is the standard. Tags: St, Valentines Day, monogamy, monogamous families, marriage, Alan Caruba, Warning signs To share or post to your site, click on "Post Link". Please mention / link to the ARRA News Service. and "Like" Facebook Page - Thanks! Arkansas, as are some other states, are facing issues like the "Private Option" in regard to The Affordable Care Act, aka, Obamacare. In the 2013 legislative session, Arkansas adopted the 'Private Option." However, a significant number of the members in the legislature voted opposite of what a majority of their constituents wanted. 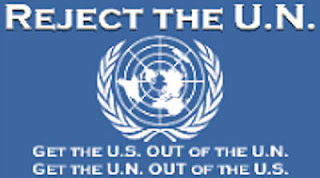 Arkansans have also voted twice in Presidential elections to reject the agenda of Barack Obama by over 62%. Although the legislature voted for the "private option" in the last session, the legislation was not funded. Funding legislation is now being considered in the 2014 legislative session. So, the legislature has an option for a "Do Over." Not funding the private option would in effect defeat the Arkansas Obamacare "private option." On February 4, 2014, Attorney Jonathan Ingram, Director of Research, for the Foundation for Government Accountability, testified before a joint session of the House and Senate Interim Committees on Public Health, Welfare and Labor in Little Rock, Arkansas. Below is his complete testimony with charts which depict the significant financial risk for Arkansas taxpayers if the legislature were to fund and implement the Arkansas Private Option. Jonathan Ingram, Foundation for Government Accountability: Chairman Burris, Chairperson Bledsoe and Members of the Committee, thank you for the opportunity to speak today. My name is Jonathan Ingram. I am an attorney and serve as director of research at the Foundation for Government Accountability. We are a non-partisan research organization focused exclusively on health and welfare issues and we work with legislators and executive branch officials across the country to improve failing Medicaid programs. You can learn more about our work at MedicaidCure.org. As this Committee well knows, there is an open question of whether the special terms and conditions of Arkansas’s Private Option waiver conflict with the Act’s requirements that it be terminated upon appropriate notice. The Act restricted the Department of Human Services to only seek waivers and state plan amendments that comply with the authorizing legislation, including the termination plans. Some language in the waiver’s special terms and conditions indicate that phasing out the program, letting it expire or amending the waiver could take longer than the 120 days envisioned by the Legislature. Simply amending the state plan, as the Department of Human Services previously suggested, also comes with its own timeline and approval process. Each of these options require federal approval and it is unclear whether the state would be able to make those changes apply retroactively to a date prior to final approval, because this is a change to eligibility and not to something such as payment rates or covered services. This issue, while complicated, is extremely important for several reasons. The largest reason is that it is entirely possible that federal financial support for the Private Option will fall below 100 percent during the next three years. The special terms and conditions agreed to by the Beebe administration features a monthly per-person cap on federal support. The state is responsible for all costs which exceed that cap. But the statute authorizing the Private Option contains contingencies in case federal support falls below promised levels. Indeed, costs so far appear to be above the state’s initial projections. Based on the latest audit report, actual per-person costs have exceeded projections by about $4.40 per person, per month. - Although the state built a little wiggle room into the cap it negotiated with the federal government, Arkansas is already dangerously close to that cap. Given the inherent unpredictability in the Private Option’s design, there is a very real possibility that you will exceed this cap in the coming months and years. Exceeding that per-person cap by just a few dollars can result in the state having to repay the federal government tens of millions of dollars in Medicaid funds. More problematic, however, is that the cap will only grow by 4.7 percent annually. The state, in its waiver request, predicted costs to rise by roughly 5 percent per year. Last spring, when Optimus projected costs for the Private Option, it predicted costs would increase by roughly 6.5 percent annually. Not only do you face the very real possibility of exceeding the initial cap, but if the costs grow even a few percentage points faster than the waiver allows, the state is looking at potentially repaying the federal government hundreds of millions of dollars. The design of the program makes these kinds of cost overruns highly likely. Unlike Medicaid managed care reforms, for example, the state does not set multi-year contracts through competitive bidding under the Private Option. Instead, the state pays premiums and additional subsidies to cover deductibles, coinsurance, copayments and other out-of-pocket costs. The state simply has no real negotiating leverage with the plans and no predictability of future premium increases. The fact that enrollees can pick any Silver plan at no cost creates even more unpredictability. In some regions, the difference between the lowest-cost plan and the most expensive plan is nearly 90 percent. In Fayetteville, for example, the least-expensive Silver plan available to a 37-year-old costs roughly $3,200 per year in premiums. But the most expensive plan costs more than $6,000 per year in premiums. Private Option enrollees have no incentive to pick those lower-cost options. While these individuals were supposed to have the same amount of cost sharing, those in the Private Option can expect to pay hundreds or even thousands of dollars less than similarly-situated populations in the exchange. And, of course, those below the federal poverty level will pay absolutely nothing under the Private Option, at least under its current terms. There are other issues where the waiver seems to differ from legislative intent, at least as expressed during committee, in town halls, to constituents and in the legislative chambers, though these are not necessarily in direct conflict with the express language of the statute. See complete Report for referenced footnotes supporting testimony. Tags: Arkansas, private option funding, legislative hearing, testimony, research, Jonathan Ingram, Foundation for Government Accountability, uncover Obamacare, taxpayers, To share or post to your site, click on "Post Link". Please mention / link to the ARRA News Service. and "Like" Facebook Page - Thanks! 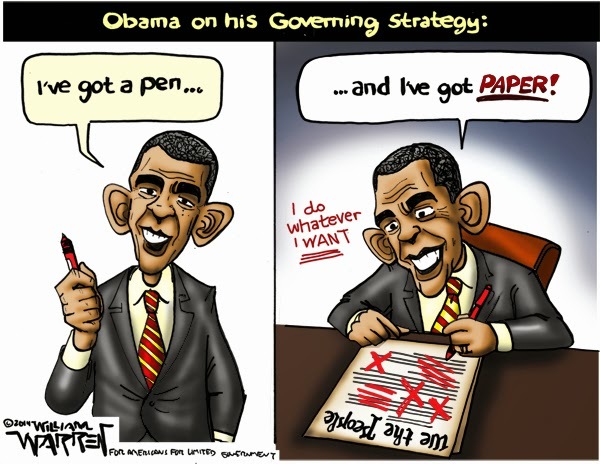 Tags: Barack Obama, I've Got A Pen, editorial cartoon, William Warren, The Constitution To share or post to your site, click on "Post Link". Please mention / link to the ARRA News Service. and "Like" Facebook Page - Thanks! GOPUSA - Washington Times (DC): President Obama is using every executive power in his arsenal to infringe on Second Amendment rights. Dr. Murthy is the 36-year-old president and co-founder of Doctors for America, a group that advocates for Obamacare and gun control laws. The group calls gun violence "a public health crisis." It pushes for Congress to ban "assault weapons" and "high-capacity" magazines and calls for spending tax dollars for more gun-control research. The organization also lobbies for doctors to be allowed to ask patients, including minors, whether they have legal guns in the home. 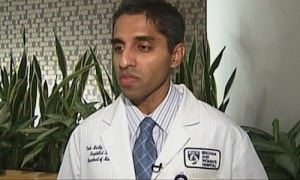 If the patient admits to having guns, Dr. Murthy wants doctors to "counsel them appropriately about safety measures." Gun rights advocates and many families view this policy as a violation of privacy. At a hearing before the Senate Health, Education, Labor and Pensions Committee last week, Sen. Lamar Alexander asked Dr. Murthy about public comments on firearms, such as a tweet from before the 2012 president election that said, "Tired of politicians playing politics w/ guns, putting lives at risk b/c they're scared of NRA. Guns are a health care issue." Mr. Alexander, the ranking Republican on the committee, told Dr. Murthy that "Americans have a First Amendment right to advocate the Second Amendment -- or any other amendment. And the Second Amendment is not a special interest group, it's part of our Constitution." The Tennessee senator added that, "If your goal is to make guns the bully pulpit of your advocacy in the surgeon general's office, that would concern me." Dr. Murthy sidestepped the questions about his gun-control agenda from committee members throughout the hearing. However, Mr. Murthy's Twitter timeline is chock full of his anti- firearm screed. "NRA press conference disappointing but predictable - blame everything in the world except guns for the Newtown tragedy. That same month, he tweeted that, his group had "launched doctor- nurse campaign demanding gun safety legislation from Congress." His spin on Mr. Obama's failed effort to pass gun control in the Senate last April was to say: "Signs of progress-we got 20 votes in the senate in favor of gun violence legislation that we wouldn't have had 1 year ago. Have faith." Mr. Obama's pick for the next "nation's doctor" is purely political. Former Surgeon General Richard Carmona wrote a letter to the president in December to protest nominating Dr. Murthy because he is not qualified. Dr. Carmona said that Dr. Murthy appeared to have "no significant related leadership experience and no formal public health training or experience." Unfortunately, Dr. Murthy is almost assuredly going to be confirmed -- especially since Senate Majority Leader Harry Reid changed the rules so only 51 votes are required for nominees. The surgeon general oversees the Public Health Service Commissioned Corps and three national health councils. It is a role for the most seasoned and knowledgeable doctor available for the position, not a political lackey who will use the public profile to push a leftist political agenda. Tags: President Obama, nominates, gun grabber, surgeon general, Dr. Vivek Murthy To share or post to your site, click on "Post Link". Please mention / link to the ARRA News Service. and "Like" Facebook Page - Thanks! Today in Washington, D.C. - Feb 13, 2014. The Senate is not in session today. A couple Senate leaders are scheduled to tomorrow 10:00 AM for a pro forma session. Next week the Senate will be out for their State Work Period. S 25 (95-3) - Motion to Concur in the House Amendment to S.25; An act to ensure that the reduced annual cost-of-living adjustment to the retired pay of members and former members of the Armed Forces under the age of 62 required by the Bipartisan Budget Act of 2013 will not apply to members or former members who first became members prior to January 1, 2014, and for other purposes. S. 540 (55-43) - Motion to Concur in the House Amendment to S.540; An act to temporarily extend the public debt limit, and for other purposes. Every Republican opposed the hike. Patriot Post noted "[T]he cloture vote to actually bring the bill to the floor was 67-31, with 12 Republicans voting to end debate. Sen. Ted Cruz (R-TX) insisted on the 60-vote threshold because no spending cuts were attached to the deal. Raising the debt ceiling has become little more than a formality because spending only ever goes in one direction – up. Even the “cuts” the GOP is fighting to win are reductions in the growth rate. And it's because precious few in Washington actually care about anything beyond the next election." Confirmed (97-3) Catherine Ann Novelli, of VA, to be United States Alternate Governor of the International Bank for Reconstruction and Development. Confirmed (98-0) Daniel Bennett Smith, of Virginia, to be an Assistant Secretary of State. Confirmed (98-0) Tina S. Kaidanow, of D.C., to be Coordinator for Counterterrorism. The House is not in session. They will also be State / Constituent Work week. The Congressional Calendar reflects their return on Feb 25, 2014. 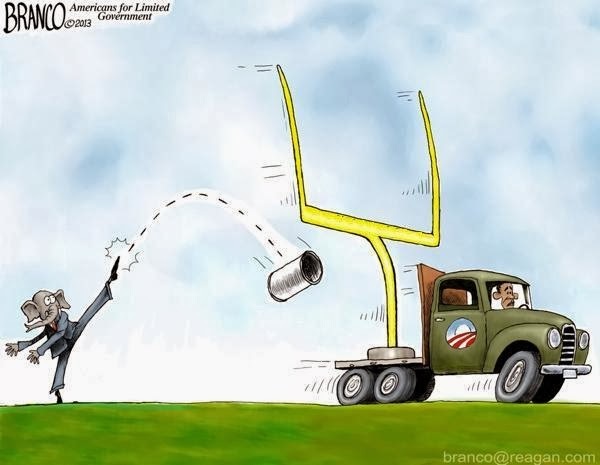 Tags: debt ceiling, Military COLA, editorial cartoon, Gary Varvel To share or post to your site, click on "Post Link". Please mention / link to the ARRA News Service. and "Like" Facebook Page - Thanks! 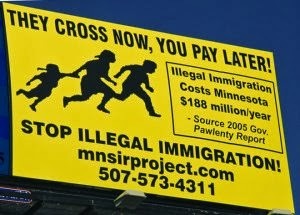 2007 Minnesota illegal immigration billboard. Worse and the Cost is Bankrupting America. Tags: Poll, illegals, amnesty, Phyllis Schlafly, Eagle Forum To share or post to your site, click on "Post Link". Please mention / link to the ARRA News Service. and "Like" Facebook Page - Thanks! DOE's Julio Friedmann on Cost of CCS TechnologiesCarbon capture and sequestration technology (CCS) mandated in a proposed EPA greenhouse gas regulation on new power plants will mean higher electricity costs, a Obama administration official admitted to a House of Representatives subcommittee. When asked by how much CCS will add to the cost of electricity generated by coal plants, Department of Energy Deputy Assistant Secretary for Clean Coal Dr. Julio Friedmann told the House Energy and Commerce Subcommittee on Oversight and Investigations that first generation technology will add “something like a 70 to 80 percent increase on the wholesale price of electricity.” The cost increase from more efficient, second generation CCS is expected to only be half that amount. The EPA is mandating carbon capture sequestration (CCS), but as an integrated technology, CCS has never been demonstrated on a commercial power plant, and is nowhere near ready for broad deployment. This fact has been argued by the federal government itself....Not only does the Obama administration acknowledge that the technology isn’t ready, it also admits that it will significantly increase electricity costs. Sean Hackbarth, U.S. Chamber of Commerce To share or post to your site, click on "Post Link". Please mention / link to the ARRA News Service. and "Like" Facebook Page - Thanks! Alan Caruba, Contributing Author: From 1955 until I graduated in 1959, I was a student at the University of Miami. Those were halcyon years for me, enhanced by Florida’s famed bounty of sunshine and warmth. Born and raised in New Jersey, it was a respite from the Garden State’s winters, shoveling snow, and enduring the chill. The last time I was in Florida was in 2004 to visit my older brother in Boynton Beach and when the wall of heat hit me as I exited the West Palm Beach airport, I knew I would remain in Jersey. I am no fan of winter. I don’t ski or ice skate. When it’s cold I stay inside where it’s warm. I venture outside once a day to turn over the car engine while picking up a lottery ticket in hopes of winning enough money to live somewhere warm during the winters here. I don’t know how many blizzards or just big snowstorms I have lived through at this point in my life. In my experience, most people tend to forget them when springtime arrives. Winter, which often seems to have no end, is still only four months, a quarter of the year. After decades of “global warming” lies from Al Gore, environmental organizations, and government agencies, I knew well that, while the northern hemisphere had begun to warm around 1850 after a long cold cycle and the amount of warmth was sufficient to provide comfort, it was too small for anyone to effectively measure. One of my favorite quotes is from Dr. Richard Lindzen, a professor of atmospheric science at MIT: "Future generations will wonder in bemused amazement that the early 21st century's developed world went into hysterical panic over a globally averaged temperature increase of a few tenths of a degree, and, on the basis of gross exaggerations of highly uncertain computer projections combined into implausible chains of inference, proceeded to contemplate a roll-back of the industrial age." I am pretty sure that those who lived through earlier blizzards and snowstorms did not consider them as anything other than normal. Some, though, made history. History.com even has a list of major U.S. blizzards. Perhaps the most famed was the Great Blizzard of 1888. It dumped 40 to 50 inches of snow in Massachusetts, Connecticut, New York and New Jersey. More than 400 people died; the worst toll of a winter storm. A year later in 1889, a blizzard started in Florida and then moved up the coast dumping 20 inches of snow on Washington, D.C. and 34 inches on New Jersey. The Great Blizzard of 1888 led legislatures in Boston and New York to break ground on the country’s first underground subway systems. Those of us on the East Coast would wait a century until 1993 for a combination blizzard and cyclone “wreaked havoc from Cuba to Canada” killing 310 people in its wake. 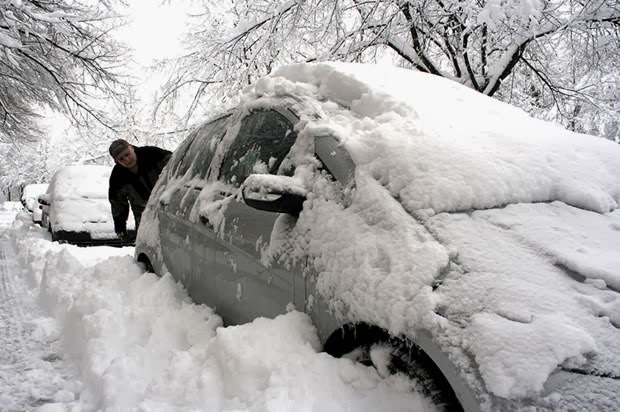 In February 2010, snowstorms were raging from northern California to North Carolina, but typically it was the Mid-Atlantic and New England States that were hardest hit. In January, record freezing temperatures gripped the entire nation. Energy consumption set some new records as well. Icy conditions in storms since then have left some areas without any energy and yet the environmental organizations keep fighting the development of any new sources of coal, oil and natural gas to provide needed energy. The White House has done everything in its power to accommodate this idiocy. On February 7, The New York Times published an article by Porter Fox, the features editor at Powder Magazine—as in snow powder—and author of “Deep: The Story of Skiing and the Future of Snow.” Fox may know about skiing, but his knowledge of snow consists of his belief that, all over the world, “snow is melting.” This is straight out of the global warming belief that the small amount of warming since the mid-1880s was a threat to the planet. “The planet is getting hotter.” As Dr. Lindzen points out, a few tenths of a degree is meaningless. A few years ago, The New York Times shut down its environmental reporting unit, laying off some and reassigning others. Now, apparently, it is content to publish utter nonsense about how all the snow is melting everywhere. In recent weeks and days there has been heavy snow in Tokyo, Japan, that took some lives. Heavy snow has fallen in Austria and Italy, as well as northern Iran. People around the world are looking out their window and seeing snow. Blizzards are a seasonal reminder that humans do not control the Earth’s climate. The Sun does that along with the oceans, volcanic activity and other natural factors. They only thing humans can and must do is endure them. Tags: snow, ice, global warming lies, Alan Caruba To share or post to your site, click on "Post Link". Please mention / link to the ARRA News Service. and "Like" Facebook Page - Thanks! House punts on debt ceiling | Sen.McConnell: Middle Class Again Left Out Of Obamacare Exemptions: "Obamacare Is A Law That’s Just Not Fair"
The Senate reconvened at 9:30 AM today. Following 90 minutes of morning business, the Senate began consideration of a slate of four executive branch nominees. At 11:30, the Senate will vote on confirmation of the nominations of Tina S. Kaidanow to be Coordinator for Counterterrorism, Daniel Smith to be Assistant Secretary of State for Intelligence and Research, and Catherine Novelli to be U.S. Alternate Governor of the International Bank for Reconstruction and Development and Undersecretary of State for Economic Growth, Energy, and the Environment. By unanimous consent, the Senate will at 1:30 PM take up the motion to concur in the House amendment to S. 25, which is the paid-for House-passed bill to restore military retirement pay. There will be a vote on the motion to concur around 2 PM. Later today, the Senate could vote on the House-passed debt limit bill, S. 540. Yesterday, the Senate voted 98-0 to confirm Richard Stengel to be Undersecretary of State for Public Diplomacy, 97-1 to confirm Sarah Sewall to be Undersecretary of State for Civilian Security, Democracy, and Human Rights, and 92-6 to confirm Charles Rivkin to be Assistant Secretary of State for Economic and Business Affairs. H.R. 3448 (412-4) — "To amend the Securities Exchange Act of 1934 to provide for an optional pilot program allowing certain emerging growth companies to increase the tick sizes of their stocks." H.R. 3578 (Voice Vote) — "To ensure that any new or revised requirement providing for the screening, testing, or treatment of an airman or an air traffic controller for a sleep disorder is adopted pursuant to a rulemaking proceeding, and for other purposes." S. 25 (326-90) — "To direct the Secretary of the Interior to convey certain Federal features of the electric distribution system to the South Utah Valley Electric Service District, and for other purposes." S. 540 (221-201) — "To designate the air route traffic control center located in Nashua, New Hampshire, as the "Patricia Clark Boston Air Route Traffic Control Center"." Amended to be the "Temporary Debt Limit Extension Act." The ARRA News Service addressed the votes on this bill yesterday. Robert Romano, senior editor of Americans for Limited Government, responded today, "House leaders could have offered a variety of amendments to the measure dealing with these issues. Win or lose, at least constituents would have known where their representatives stood on using the power of the purse to achieve certain priorities. 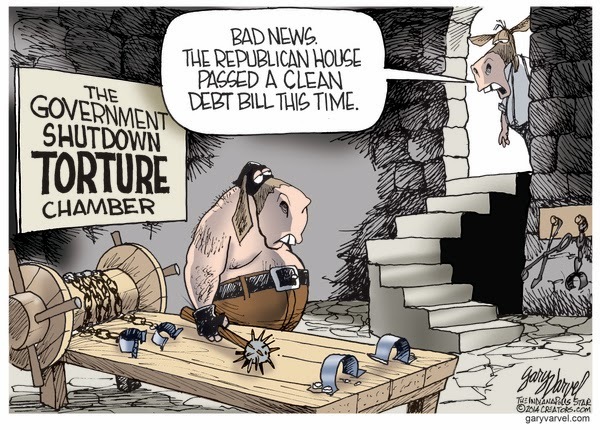 Instead, by punting on the debt ceiling, Republicans have punted on the remainder of this session of Congress, thus allowing Democrats attempting to hold onto the Senate in 2014 to avoid dealing with any real issues during the remainder of this election cycle. They might as well extend their upcoming two-week recess to the end of the year. Either way, the same amount of nothing will be accomplished." Tags: House punts, debt ceiling, Sen. McConnell, middle class left out, Obamacare To share or post to your site, click on "Post Link". Please mention / link to the ARRA News Service. and "Like" Facebook Page - Thanks!